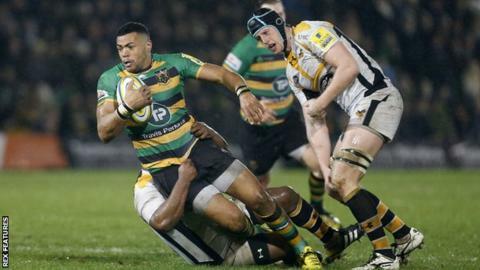 Northampton's Luther Burrell is playing with a "smile on his face", says Saints director of rugby Jim Mallinder. Burrell struggled for form after being leaving out of the World Cup squad, but has formed a strong centre partnership with Harry Mallinder for Saints. "He's playing with a smile on his face and looking fast, running hard with the ball, making good decisions and is strong in defence," said Jim Mallinder. "It's really pleasing that Luther is back on his game." The 28-year-old was called up as injury cover to England's Six Nations squad earlier this month, and Mallinder added: "He probably enjoyed the experienced with England and he's coming back and trying to get back into that first team." Burrell set up Tom Collins for one of the winger's three tries in Saturday's win over Premiership strugglers Worcester, which left Saints fifth and three points off the play-offs. But youngster Collins credited his team-mates, including Burrell for a "perfect pass", for setting up his three tries after a time out on the sidelines. "It's my first hat-trick in professional rugby," Collins told BBC Radio Northampton. "But it's all down to the lads down there, I just finished off all their hard work in the corner. "It's the collective team effort - it shows that the team is coming together and scoring tries."